D-Empress tries a new healing therapy with a pinch of salt. promote healing. As vital to the human body as water, we need a daily intake of salt to maintain a healthy body. As the world moves towards Earth- friendly approaches to healing, traditions using salt are re-emerging as a non-invasive choice. In recent times, Africa’s salt gift to the world has come from the Kalahari Desert. 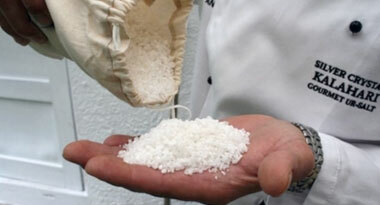 Over the past six years, Kalahari Salt has become the toast of Gourmet Chefs around the world. Packaged in Johannesburg by Kalahari Pristine Salt Worx, Silver Crystal Gourmet Salt is 100% pure, all-natural and sun-dried salt. In Brussels this year, the International Taste & Quality Institute awarded Silver Crystal Gourmet Salt a Superior Taste Award certificate. Packaged in cotton bags, the Kalahari gourmet salt range also extends to a collection of bathing salts, boxed with exquisite high-quality essential oil blends. And from gourmet and bath salts to the newest salt healing therapy: salt rooms. Africa’s first salt room takes an ancient tradition of salt cave therapy and packages it in a plush bliss zone at Armani Spa in the Radisson Blue Hotel in Johannesburg .Created by Synergy Salt Therapy, the salt room is a therapeutic healing space. Opening this month, marking spring time rejuvenation for 2010, the salt room at the Radisson is modeled on the tradition of the salt caves, popular across Europe and South America. 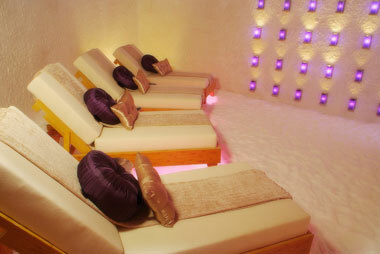 Synergy Salt Therapy offers treatments that replicate the microclimate found in salt mines and caves across the world. Using 5 Tons of Kalahari salt the salt room is created by layering grains of varying sizes on the walls and floor. Regulated temperatures and humidity combine with the salt to create a hypo-bacterial and allergen-free air environment. Craig Cormack is using Kalahari Salt as he is delighted by the flavour, the full roundedness and the tremendous enhancement of food! All Things Culinary, Craig Cormack, chef patron is specializing in creative catering, fine dining meals in your home, training of young chefs, is a consultant to restaurants and hotels and runs workshops and food demonstations. Craig also co - owns his own restaurant, Overture, situated in a wine estate in Stellenbosch, Western Cape,with his partner Basson, a deli shop in Stellenbosch, and owns the restaurant, called Café Misto. Promoted by the Chaine des Rottiseurs to Vice Consileur Culinaire for the regional committee Western Cape 2007. Winner of 4th place in South African Eat out Awards. Member of the Olive & Olive Oil tasting panel – Olive Oil Awards South Africa in 2006/7/8. Was executive chef at the Village Hotel at The Spier Wine Estate. Promoted to Maitre Grilladin during the Grand Chapitre held in Cape Town. Represent the South African Chefs Association in 2004. Published his first book in 2002, a training manual which is sold to public and many semi government chef schools and colleges. Was head chef in Ellerman house, Bantry Bay, Cape Town, voted best Boutique Hotel in Africa and number 13 in the world. The Black Forest Bakery was established in 1935 as Café Echo in Johannesburg. Owner Volker Speer is as passionate about baking as his father. Together they created one of the best different rye breads, health breads, confectionery items and pastries. They were always concerned about a high quality product and still today import specialized flours from Europe to cater for different needs and the growing demand for gluten free and wheat free breads. Adding to the high quality of their product they also decided to use only the pure inland Kalahari Salt which improves the taste of their bread and the health value so that their product live up to their high quality reputation. Some of their clients are: Spar, Pick ‘n Pay Family Stores, Delis, Health Shops and Fruit And Roots. "The Loaf is situated in the Fourways area of Johannesburg and produces traditional bread that uses 100% natural fermentation and is baked in a wood-fired brick oven. Since we switched to Kalahari Salt two weeks ago, we have noticed that the dough of our bread is smoother and has a better texture. Changing to Kalahari Salt has enhanced the flavour of our bread. We also noticed that, in comparison with other salts, Kalahari Salt is far cleaner – no residue when dissolving the salt in water. 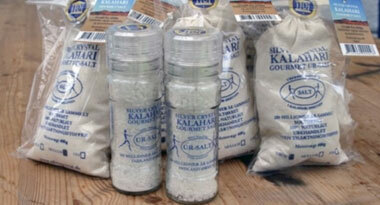 We do not hesitate recommending the Silver Crystal Gourmet Salt from Kalahari Pristine Salt Worx." HOTEL NEGRESCO: Classified a National Historic Monument, it is one of the few remaining privately owned palaces in the world and one of the leading Hotels in the world, which is situated in Nice at the French Riviera. One of the best restaurants in France and the best in Nice, where Michel Del Burgo’s refined, inventive French Cuisine has enchanted many people. CHEFS DES CUISINES: MICHEL DEL BURGO has a passion and fascination for cooking since he was a child. He spent hours looking at his father cook in their family’s restaurant in Avesnes-sur-Helpe, in Aisne, to become what he is now: A GREAT CHEF. Michel Del Burgo’s French Cuisine is contemporary and creative, rich by its culinary tradition as well as his experiences acquired through the years. At the age of 18 years old, after participating in a competition for the best apprentice in France, he learned the basics of cooking in a “3 stars Michelin’s Guide” restaurant, l’Oustaou de Baumaniere”, where the “biggest of this world” Kings and Queens, heads of State and Artists’ lunch and dine. He has worked as a chef des Cuisines in the best and most famous restaurants in France, such as Michel Guerard, la Barbacane in Carcassone which gained 2 stars in the Michelin’s Guide, the Tailevent in Paris with 3 Stars, before working in the Negresco’s restaurant the Chantecler, to name only a few. Michel Del Burgo only wants the best products for his French Cuisine and therefore chooses “Silver Crystal” gourmet salt to give his meals the best most natural flavour. For more info on Michel Del Burgo go to: http://www.yahoo.fr and type Michel Del Burgo. 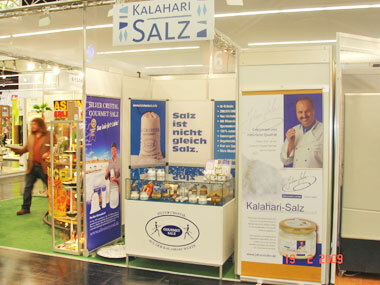 To enhance you meals within your own home choose Silver Crystal Gourmet Salt used by the great culinary chefs. Pat Duxbury from Waybury International guesthouses use SILVER CRYSTAL GOURMET SALT because it is totally natural and enhances in flavours of all my meals. Waybury House, an international guest house in Bryanston, Johannesburg, is constantly trying to give the best cuisine to their international guests. 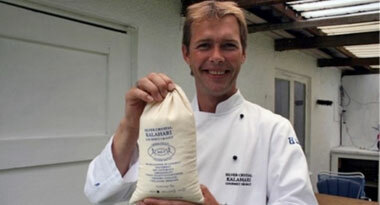 Par Duxburry, founder of the guest house is a Cordon Bleu Chef and has many years of experience in the cooking trade. She has been creating and tantalizing creations of food, with only the most natural ingredients. Pat Duxburry uses silver crystal gourmet salt. CATZ PYJAMAS, a 24 hour bistro located in Mellville Johannesburg, open 7 days a week, has been successfully run by Natascha Cotzee for the last ten years. Natascha chooses a high standard of food and uses only natural, organic SILVER CRYSTAL GOURMET SALT for a definite improvement in the taste of her cuisine. Niels Hansen med en pose af det 280 milllioner år gamle Kalaharisalt, der sælges som både groft, mellem og fint salt. Et 280 millioner år gammelt produkt er blevet en ny delikatesse på de danske køkkenborde, takket være en smed fra Holte. Niels Hansen begyndte for et år siden at importere salt fra Kalahariørkenen i Sydafrika, og det ældgamle salt, der "høstes" 300 kilometer fra den nærmeste by, er på vej til at blive et lille iværksættereventyr for den 42-årige forhenværende smed. 65 butikker i Nordsjælland forhandler nu det specielle ursalt, og senest har Øllingegård Mejeri i Skævinge valgt at bruge saltet i sit økologiske smør. Også på Kokkeskolen i Hillerød, der uddanner kokke, er havsaltet skiftet ud med Kalaharisalt. "Man kan sige, at smeden fandt det hvide guld i ørkenen," siger Niels Hansen om sin historie, der startede tilfældigt, da han besøgte sin nuværende kone, der kommer fra Sydafrika. Niels blev gjort opmærksom på det usædvanlige salt fra Kalahariørkenen, han fik ja til at forsøge en import til Danmark, og efter en omstændelig godkendelse hos de danske fødevaremyndigheder var vejen banet til de danske køkkener. "Der er tale om et naturligt, uforarbejdet produkt, som kommer fra et forureningsfrit område ude i ørkenen og er rig på mineraler. Det er et sundt alternativ til det raffinerede salt, som fødevareindustrien bruger, og til havsalt, som er forurenet, fordi havvand er forurenet," siger Niels Hansen. "Sammensætningen af mineralerne og det, at saltet er uforarbejdet gør, at det får en unik smag. Det er også mere drøjt, så man skal ikke bruge lige så meget, som hvis man bruger forarbejdet salt," siger han. En håndfuld salt fra Kalahariørkenen. Kalaharisaltet er samme type salt som det berømte salt fra Læsø. Det er blot noget billigere og faktisk 30 millioner år ældre end Læsøsalt, der "kun" kan skrive sin historie 250 millioner år tilbage. Niels Hansens egen salthistorie er indtil videre et år gammel, men han er sikker på, at der venter mange år forude til Silver Crystal, som er navnet på hans virksomhed. "Et af mine mål er at få fat i fødevareproducenterne. Alle, der vil lave nogle ordentlige produkter, skal også bruge noget ordentligt salt," siger Niels Hansen. "Jeg slog lejr og tændte et bål for at grille en T-bone-steak. Lugten af kødet tiltrak løver, så jeg spiste maden i mit telt. Næsten morgen var der seks løver udenfor, da jeg åbnede teltdøren. Men heldigvis kom en af mine venner i bil og fik skræmt løverne væk," fortæller Niels Hansen om sin tur til det sted i Kalahariørkenen, som meget passende kaldes for "Løveland".